Build a future for your family in a huge growth market using the latest in technology developed over 40 years. Be supported and contribute to, a dedicated network of like minded business people. This is an opportunity many have been waiting for in a technical and lucrative market segment. After 40 years of development and currently operating with company owned technicians in Vic, NSW, Qld and SA, a unique opportunity presents Australia wide. Our strategic marketing efforts are implemented at a national level to help you promote your business and succeed. At a local level we teach you everything from local area marketing and advertising, to social media posting, updating your own website, Search Engine Optimisation and Google AdWords campaigns. We provide you with the right marketing tools strategically designed for results including our CRM cloud based system. More importantly we provide you the knowledge and skills on how to effectively implement them - the critical component. The training your receive is exceptional in every aspect and world leading. We teach you every aspect of running your business from the technical aspects of the restoration and coating service offerings to the business planning, marketing, accounts, insurance and OH&S compliance. • Four weeks intensive training at the University of Graffitiology. • 22 weeks of personal followup BDM mentoring while you get established. • All financial and job management IT system setup and training. • Ongoing coaching and bench marking. - Sick of being a number and want to control your destiny? To join our team no experience is necessary, having a technical background or pressure cleaning exp is not at all a prerequisite for this business. All training is provided! We have successful team members from all different backgrounds. What they do possess though is brand passion, loyalty, drive and a strong commitment to customer service. Your attitude + Our system = A winning partnership. The Graffiti Eaters is a multi award winning 2nd generation family business that has been operating for 40 years. 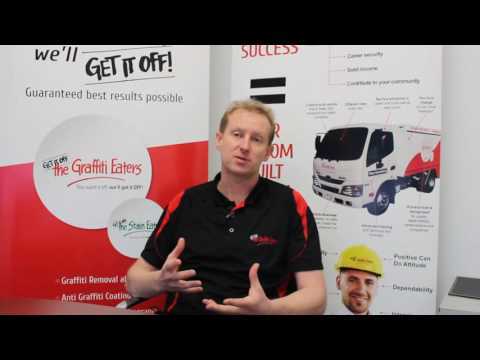 The Graffiti Eaters franchise model has been perfected over its 40 year journey, which is why it has a proven track record and all the right ingredients to help you establish a successful business. If you are looking for a solid, well designed and experienced business model in which to leverage off to build your own business, then this opportunity could be just what you have been waiting for. With over 20 different surface cleaning, coating and sealing services available from the one vehicle, you can provide a wide range of high value services to a wide range of markets. Best of all is that you get to piggy back onto our Certified Quality Management Standards including Environmental Management. This ensures Graffiti Eaters can tender for key government and corporate clients. The comprehensive training program provides all the necessary tools to learn the industry, the unique system, as well as the all import lessons of what not to do! Franchisees begin by attending 4 weeks of intense training at the University of Graffitiology in Bundoora Victoria. Ongoing training and support is a key feature of the Graffiti Eaters support community. Franchisees need to be people orientated and enjoy building professional sales relationships with customers. Self-motivated with a passion to succeed are also essential attributes. Why join The Graffiti Eaters? • The Graffiti Eaters brand is the quality choice for: Body Corporates, Schools and Universities, Real Estate Agencies, Local Councils and Governments, Commercial businesses and Local Residents. • Strong proven business model. • Mobile business with no property lease or shop refit costs. • Multi vehicle growth opportunity. • Extensive training and ongoing support. • No prior experience necessary. • Territories professionally independently surveyed. The Graffiti Eaters began 40 years ago and is a very successful second generation family business that operates nationally around Australia. Great time and care has been built into this business model with its very own distinctive features making it a truly turn key business model. - Very efficient custom in house built, Surface Restoration Vehicle. - Range of 26 different cleaning solutions for great results. - Quality assurance accreditation system. - Fully cloud based IT infrastructure with GPS scheduling.